The low entry lite hybrid bus is born (with a curb weight under 9 tonnes for the solobus), Urbino and Trollino change look. 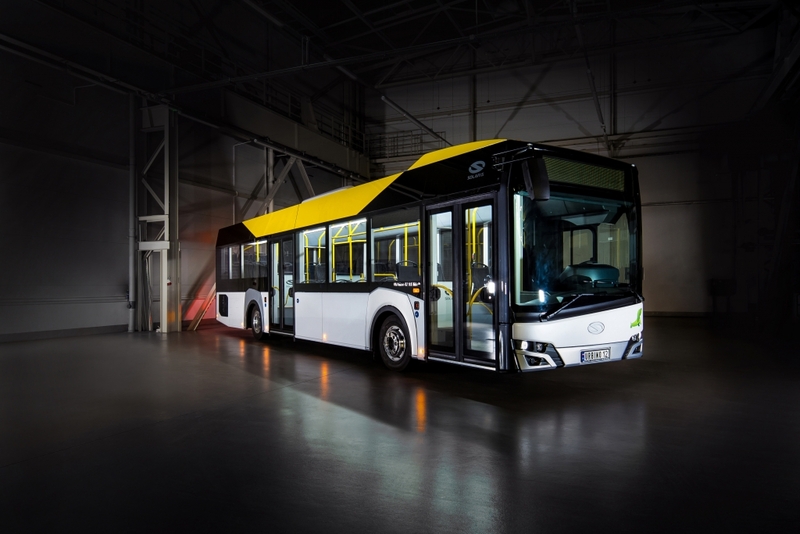 Solaris marks its presence at this year’s Czechbus trade fair (20 – 22 November) showing two buses. It’ll be the premiere both of the mild hybrid Solaris Urbino 12 LE lite hybrid and of the new design of the Urbino and Trollino family. Up to now, Solaris electric buses have covered over 9 million kilometres. 350 zero emission vehicles have been ordered and supplied, while over 2,000 feasibility studies have been carried out for electric bus launches. The Urbino LE lite hybrid is a complete product novelty: a bus with low operating costs and lighter than the standard vehicle structure. 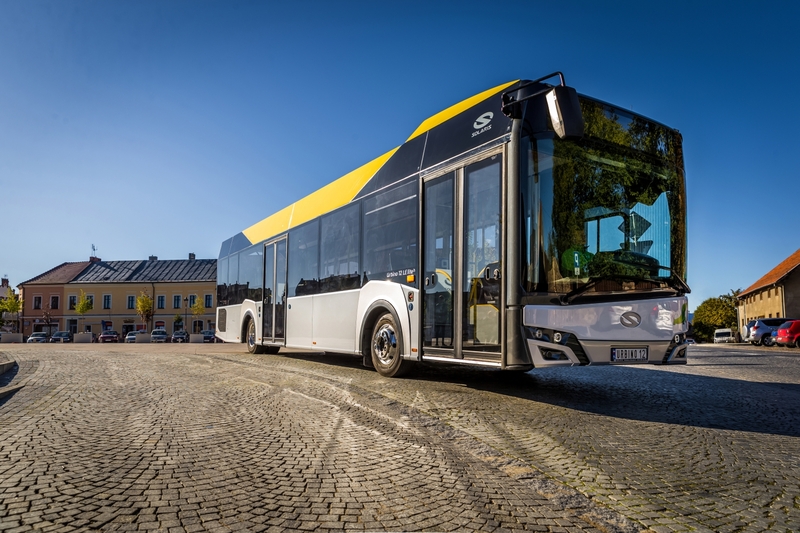 The main objective of the engineers of the Solaris Research and Development Office who developed the Urbino lite hybrid was to create a bus, which would consume less than 30 litres of fuel per 100 km in the SORT 2 test, explains Solaris in a press release. The curb weight of the Solaris Urbino 12 LE lite hybrid is under 9 tonnes and its weight with passengers is 15 tonnes. For instance, the VDL Citea LLE-120, that according to VDL is the result of a project focused on light weight, has a curb weight of 8,885 kg (without any electric motor given the fact that it’s a diesel bus. The full electric is around 12,715 kg). Under the bonnet there is the Cummins ISBE6 engine with volume of 4.5 litres. The unit, which fulfils the restrictive Euro VI exhaust emission standard, has 210 HP and torque of 850 Nm. The drive system of the Urbino LE lite hybrid is also equipped with a small electrical machine with nominal power of 11.5 kW, which is tasked with recuperating energy during the braking process and supporting the combustion engine when the vehicle starts moving, which consequentially leads to it consuming less fuel. 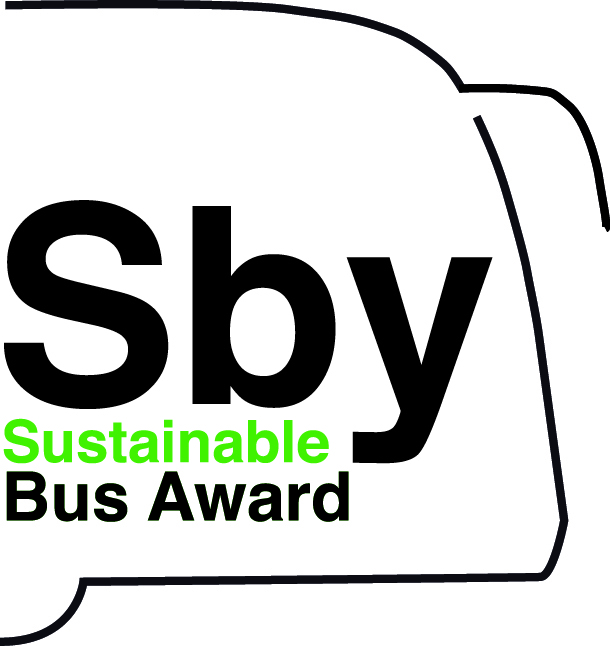 With regards to the driveline, the vehicle goes under the definition “mild hybrid” and represents a similar operation than the one developed by Mercedes with the launch of the Mercedes Citaro hybrid, equipped with 14 kW electric motor (the intercity version was awarded with the Sustainable Bus Award 2019). The Solaris Urbino 12 LE lite hybrid, Solaris points out, will be available in version with two door in the 2-2-0 arrangement. The bus will be able to take up to 85 passengers, 41 of them seated. The front axle of the vehicle is provided by ZF RL55 and the drive axle is Dana type G150. The size of the wheels used in the vehicle differs from the standard solutions applied in Solaris city buses. This vehicle will be equipped with wheels of a smaller diameter: 19.5 inches. The wheelbase of the Solaris Urbino LE lite hybrid is 5900 mm with front overhang of 2550 mm and rear overhang of 3240 mm. The safety standards fulfilled by the vehicle include those specified in provisions R29 and R66. 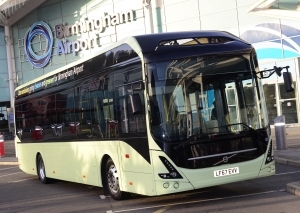 “The new Solaris Urbino 12 LE lite hybrid is specifically for bus operators who see high value in low fuel emission with preservation of as much comfort as possible for passengers and drivers. 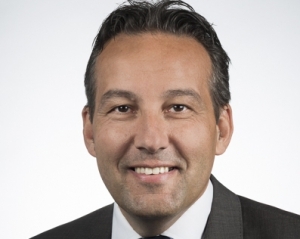 Our clients receive the quality and durability guarantee to which the Solaris brand obliges,” said Zbigniew Palenica, Vice President of Solaris in charge of Sales, Marketing, After Sales, and the Department of Rail Vehicles. In barely eight years since the début of its first electric bus, Solaris has delivered or received orders for nearly 350 vehicles from customers in fourteen countries. 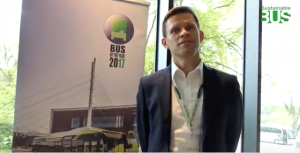 At the Czechbus 2018 trade fair the Polish producer is showing zero-emission vehicles that draw from the experience of over 9 million kilometres driven by its buses. The latest technological solutions regarding heating, cooling and the steering system were designed to help reduce energy consumption. Solaris offers its customers comprehensive investment management services that cover not only the supply of buses and charging systems, but also ensure the prepping of installations including construction works. Beyond diesel-fueled and LPG fueled heater solutions, Solaris also offers a new option where CO2 is used as the working fluid, which is currently considered the most environment-friendly solution. The use of a heat pump allows to procure heat from auxiliary devices and thus limit the consumption of energy derived from batteries, which, in turn, results in extending the vehicle driving range and ensures efficient operation at low temperatures. All of these operations occur in zero-emission mode. Another change the engineers at Solaris are already bracing for is the gradual limitation of the use of refrigerant R134a used in existing air-conditioning systems. Pursuant to EU decisions, by 2030 this substance is to be completely replaced by the much more eco-friendly R513a. 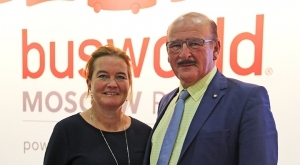 Thanks to the efforts of the Polish producer and one of its suppliers, the air conditioning of vehicles made in Bolechowo can already be supplemented with the cleaner agent. 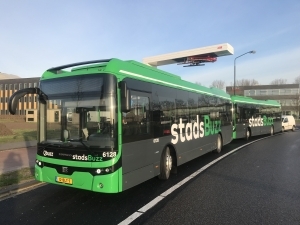 Another novelty, Solaris points out in the press release, is the remote diagnostic system for electric buses named eSConnect. It enhances and supports diagnostic and maintenance possibilities and also facilitates the analysis of specialist data derived from a vehicle. 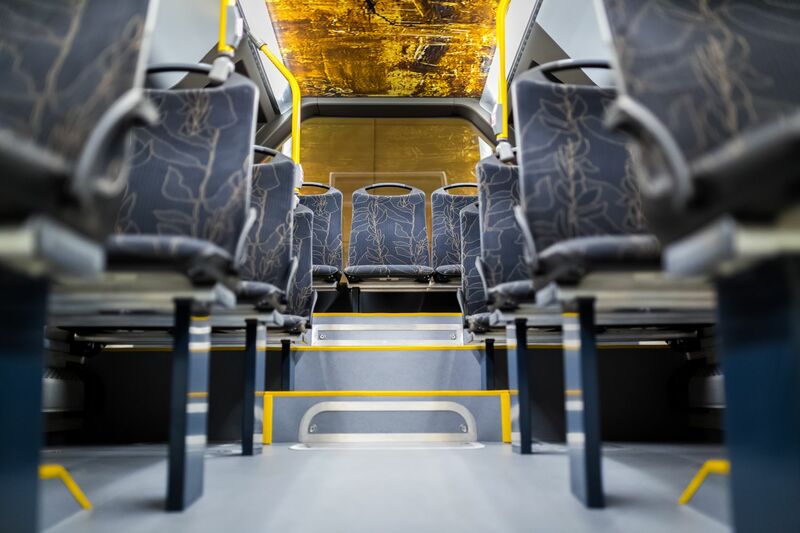 Buses equipped with a remote diagnostic system will allow the producer to establish a database of real performance data that can be later used to further perfect solutions applied by the manufacturer. 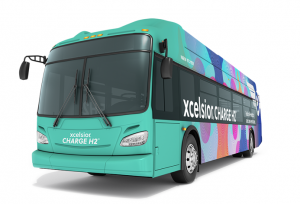 The eSConnect system may be installed both in every newly produced electric bus, as well as in those already delivered to customers. In fact, some of them have already decided to apply the pilot solution to their bus fleets. What is of importance to vehicle users, they can also use the data allowing them to optimize their bus fleet operation. 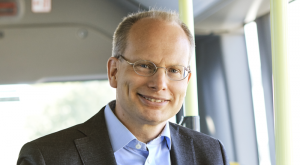 The electric bus is not just a vehicle ready to be put on the road, but the centre of a tailor made system. 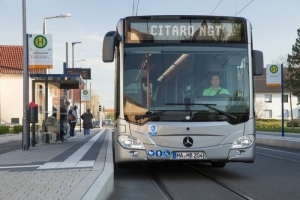 Solaris, as the major manufacturers (who are seeing their role and capabilities changing with the upcoming electric bus era), can draft individual feasibility studies with regards to the beginning or implementation of electric bus projects, based on customer requirements and a range of input data, such as the temperature range in a given city, needed to estimate energy consumption not only in normal conditions but also in extreme situations, the average speed, the topography of the area the bus line is serving, the number of stops, the passenger streams, the timetables and many other. The outcome of the feasibility study will be a report listing recommendations of the best technical solutions. This means the document will name among others the size and type of batteries, the recommended charging infrastructure, predicted energy use and the battery service life.